The mandevilla plant has become a common patio plant, and rightfully so. The brilliant mandevilla flowers add a tropical flair to any landscape. But once you buy a mandevilla vine, you may wonder what you need to do to be successful at growing mandevilla. Keep reading to learn more about mandevilla care. 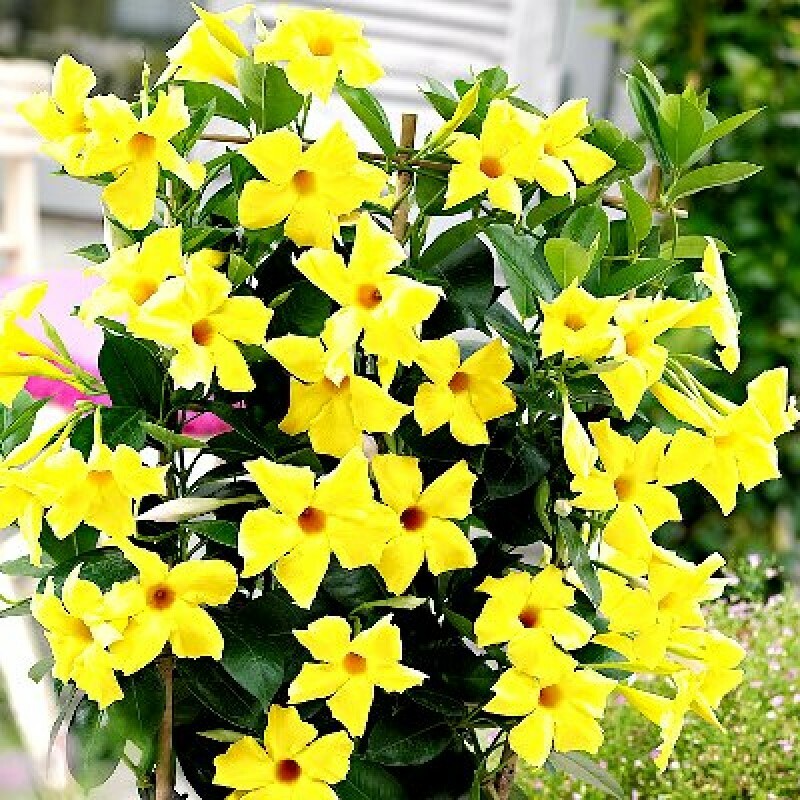 When you buy your mandevilla vine, chances are that it’s a lush plant full of flowers. You may wish to transplant it to the ground or into a bigger or more decorative container. Mandevilla flowers need sandy, well-draining soil with plenty of organic material mixed in with it. A good soil mix for mandevilla plants include 2 parts peat moss or potting soil to 1 part builder’s sand. An important part of mandevilla care is the kind of light they receive. Mandevilla vines need some shade. They enjoy bright, indirect light or filtered sunlight, but can get burned in direct, full sunlight. In order to get the best mandevilla flowers throughout the summer, give your mandevilla plant a high phosphorus, water soluble fertilizer once every two week. This will keep your mandevilla vine blooming wonderfully. You may also want to pinch your mandevilla. This method of pruning your mandevilla will create a bushier and fuller plant. To pinch your mandevilla vine, simply use your fingers to pinch off 1/4 – 1/2 inch off the end of each stem. Mandevillas are vines and they will need some kind of support in order to grow as best they can. Be sure to provide a trellis or some other support for your mandevilla vine to grow up. The mandevilla plant is often thought of as an annual but, in fact, it is very frost tender perennial. Once temperatures go below 50 degrees F., you can bring your mandevilla plant indoors for the winter. When you bring your mandevilla flowers indoors, be sure to check the plant carefully for pests and treat these pests before bringing the plant indoors. You may want to cut back the plant by up to 1/3. Once indoors, place your mandevilla vine in a place where it will get bright, indirect light. Water the plant when the soil is dry to the touch. In the spring, when the temperatures are consistently above 50 F., remove any dead leaves and move your mandevilla plant back outside to enjoy for another summer.